10% discount on tax services + answers for free! 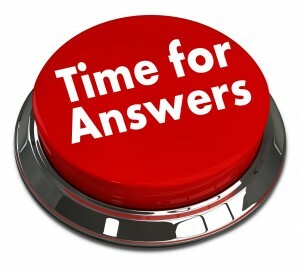 It’s nearly tax time and, after the Federal Budget, I imagine that a lot of people are going to have tax questions. Here are some ways to get tax advice for free or at a discount. 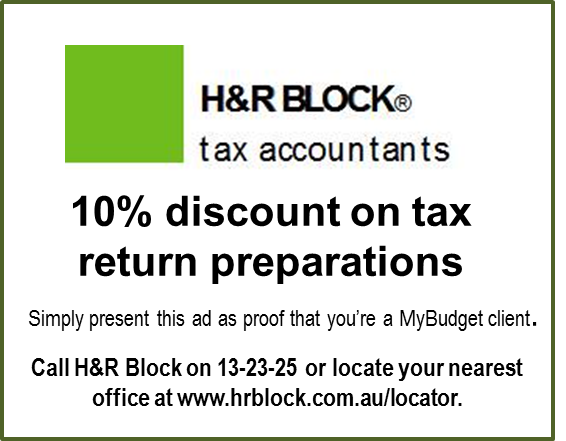 Once again, H&R Block is offering MyBudget clients and staff a 10% discount on tax return services. Print this discount voucher and redeem it at the time of your appointment. 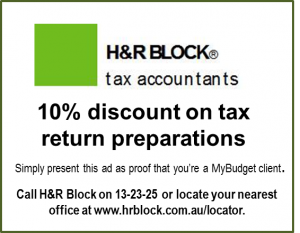 They are also inviting MyBudget clients with tax questions to email them at hrblock@hrblock.com.au. The email service is free of charge. The Australian Tax Office (ATO) also provides a Free Tax Help Program for people who earn up to about $50,000 per annum. Follow the link above or call 13 28 61. Q: I forgot to lodge my tax return last year. What should I do? Will I be in trouble? Will there be a penalty? Q: What sorts of expenses are deductible? Work clothes and equipment is an obvious one—uniforms with logos, lab coats, hard hats, safety boots etc. Items like jeans, suits, shoes, jackets, gym clothes and sneakers are considered non-specialty items unless they carry a specific business or corporate logo and your employer requires you to buy them. If you work outside regularly (eg. teachers, truck drivers, personal trainers, sales people, construction workers, security staff etc.) you can also claim sun protection equipment (sunscreen, hats, sunglasses etc.) You may also be able to claim home office expenses, self-education costs, travel costs to meet your tax agent and the medical expense rebate. One of the most important things you can do throughout the year is to keep your receipts. There might be deductions that you’re missing. Q: My employer requires me to buy their uniform. Can I claim the cost of buying it and washing it? You can only claim these items if they carry a logo, are made only for the employer and are not available to the public. If your uniform costs are tax deductible, your laundering costs will be tax deductible, too. Q: My boss lets me work from home sometimes. Can I claim a home office? Yes. The easiest method is to use a fixed rate to claim the decline in value of home office furniture and costs for heating, cooling and lighting. To be eligible, the area used as a home office must not be used for other purposes at the same time (eg. it’s not okay for other people to be watching television in the same room while you’re working.) The fixed rate allows you to claim the above expenses at the rate of 34 cents for each hour that you are in your home office and are using it exclusively for work-related purposes. Alternatively, you can retain your power bills, calculate the usage of individual appliances, and calculate the decline in value of your home office furniture. Most people prefer the first method.